Comments: William Edward Burgess (1871-1935) was a photographer and historian, who lived his adult years in Scottsville, Virginia. He was known to all as 'Willie' and worked out of Idylwood, his combination home and photo studio located in the eastern part of Scottsville that lies in Fluvanna County. An avid photographer since his teenaged years, Burgess carried his large box camera and tripod everywhere. He seemed determined to photograph everything he encountered, often appearing as if from thin air to take a family portrait or record a town event. Sometimes Burgess had to beg his busy subjects to stand perfectly still for the long exposures required for successful early photographs. But fortunately for historians, many Scottsvillians granted Burgess the time he needed photographically to capture the grace and ambience of town life during the early 1900's. Burgess was a gifted photographic technician. His studio, located under a solid glass roof in his Idylwood home, contained state of the art equipment. And when the photographic tools he needed weren't available, Burgess improvised. He washed his photo prints in a special, handmade box, which he immersed in the swift Hardware River waters near his home. Because of his thorough print washing, Burgess photographs retain their archival quality more than 100 years later. Burgess also was fascinated with broad photographic landscapes, initially piecing photos together to create a representative panoramic view. Soon Burgess owned an early panoramic camera, which he used to record such events as this 1890 race track scene at Scottsville's James River Valley Fair grounds. Additional panoramic photos by Burgess may be found in the 'Business' section of this collection; they may be recognized not only by their length but also by the characteristic bend in each scene's middle caused by lens distortion. Deeply artistic in temperament, Burgess loved beauty, saw it everywhere, and strove to capture it unblemished in his photographs. Particularly representative of his artistry are the hand tinted portraits Burgess created from his black and white photos. He used a special desk with attached seat that allowed him to pull a glass covered top into his lap with the subject photo affixed for tinting. At this desk, Burgess tinted his portraits with color brush strokes so delicate that the resulting works often are mistaken for oil paintings. Shown here is an exquisite hand tinted photo of his son, William Harold, which Burgess completed about 1910. Other examples of his hand tinting talents are included in the 'Portrait' section of this collection. 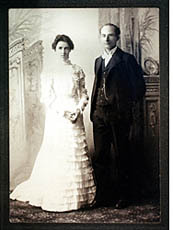 A devoted family man, Burgess married Ellen Gentry Cornett (1871-1912) on October 4, 1899, and the happy, married couple are shown here in their wedding photo. This photo was taken by J.D. Merrill of Washington, DC, and provided courtesy of Rita and William Burgess of Palmyra, Virginia. The Burgesses became the parents of three boys: Lawrence, George (1903-1913), and William Harold (1907). Their doting father frequently photographed his three sons, and the boys, as they grew older, also assisted Burgess with certain photographic chores. His youngest son, William Harold, told of helping his father wash prints in the Hardware River, a task that probably came often due to his father's photographic prolificacy. In 1912, Gentry Burgess died, and George, their middle son, died suddenly and tragically the following year. The loss of his wife and son saddened Burgess for the rest of his life. He retained a housekeeper/photo assistant to help him raise his children and never remarried. Despite his heartbreak, Burgess's enthusiasm for photography remained a vital, driving force throughout the rest of his life. His area of photographic interest enlarged to cover more of Central Virginia. Over his lifetime, Burgess reportedly photographed nearly every home, store, and interesting scene in Virginia's Albemarle and Fluvanna counties. He printed many of these photos and sold them as postcards, some of which may be viewed in the 'Postcard' section of this collection. Burgess also photographed thousands of people at weddings, reunions, meetings of Civil War and WW I veterans, school gatherings, and other events in Scottsville. Whether he realized it or not, Burgess was recording history, and today his extant photos tell us in detail how Scottsvillians lived and what they cared about in the early years of the twentieth century. On July 20, 1935, William Edward Burgess died of a heart attack during a photo shoot in Altavista, Virginia. He was buried besides his wife and young son in the Burgess Family Cemetery in Locust Grove, Virginia. One of the ironies of history is that some individuals who contribute significantly to their times, and inevitably to posterity as well are nevertheless forgotten. On occasion these contributions are quite deliberate; sometimes, totally unconscious. Whatever the case, it seems especially poignant that anyone who adds dimension to the portrait of man, acceleration to his advance through time, or grace to the manner in which he exists as an individual in his brief earthly sojourn, should be consigned to the dustbin of the past. William Edward Burgess, a native of Fluvanna County, is one of those persons who should be remembered for a special legacy he left behind when he died thirty nine years ago last summer; instead he is virtually forgotten today. It is the purpose of this brief article to preserve certain basic data about this sensitive, vivid personality. In a larger sense, an effort will be made to evaluate the accomplishments of his life which survive in present times. To rescue from near oblivion any meaningful life's work is surely a worthy task. 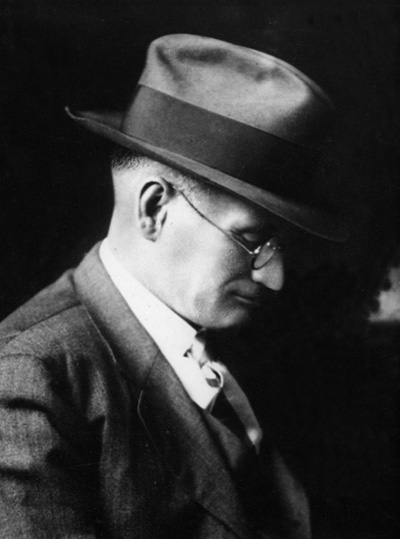 William Edward Burgess, photographer extraordinary and genuinely a fine poet, was born in 1871 at Locust Grove, the Burgess family plantation on the Hardware River between Fork Union and Scottsville. The house, surrounded by enormous boxwood and handsome trees, still stands today in remarkably good state of preservation. He was the son of Pleasant M. Burgess (1833-1906) and Sarah Elizabeth Clarke Burgess (1838-1913), solid and hard-working citizens of an earlier day when agricultural pursuits occupied first place in the attentions, interests, and exertions of Fluvanna County. There were two brothers and four sisters in the Burgess family: William, Garnett, Cornelia, Helen, Laura, and Florence. Mr. Bernard A. Burgess, prominent citizen, banker, and churchman of Fork Union, was a cousin of the Burgess family of Locust Grove. In the years after the Civil War, public schools were only rarely found, and education was hard to come by. The Burgess children traveled daily by horse and buggy to a one-room schoolhouse at Central Plains, several miles from the family plantation. In winter, a horse-drawn sleigh was used. Mrs. Katherine Pitts Phillips of Scottsville reveals William Burgess's sense of humor and mischievous attitude in a story she tells about one of these journeys from the farm to the school. "Willie," as he was familiarly known, was driving the sleigh one winter's day through deep snow. Enjoying the scaring and teasing of other children, he would constantly cause the horses to carry the sleigh to the very edge of deep snowbanks, then pull them back to safety. Suddenly he went too far; the sleigh was up-ended; and the children, carrying their lunches and individual silver spoons into the icy banks. No one was hurt, and "Willie" was enchanted with the misadventure. Despite a mad scramble, some of the silver spoons were never found, it is said. As a very young man, William E. Burgess married Miss Gentry Cornet (1872-1912); they had three children: Lawrence, George, and William Harold. George, born in 1903, died suddenly and tragically in 1913 at ten years of age, only one year after the death of his mother. This double blow saddened Mr. Burgess for the rest of his life. He retained a housekeeper to help him rear his children and remained a widower during the twenty-three years until his death in 1935. Apparently while still a teenager, William Burgess became interested in photography. He used a large box camera upon a tripod and took pictures while standing behind it with a black hood over his head and over part of the camera. According to Edward L. Dorrier, nephew of Mr. Burgess, he built a special box in which to wash his prints and placed it in the swift waters at the edge of the Hardware River near his home. The constantly flowing water through this box did the job of much more sophisticated equipment deemed necessary today. Mr. Burgess was considered by many to be a fanatic about photography. It seems incredible, but it is nonetheless true that he photographed almost every home, every store or other business enterprise, and eery scenic or historic spot in Central Virginia, especially those in Fluvanna and Albemarle Counties. In addition, he took thousands of pictures of family groups, fraternal organizations, club gatherings, meetings of Civil War and World War I veterans, weddings, family reunions, funerals, floods, and literally almost anything else one could name, including wildlife! His pictures of the campus and buildings of Fork Union Military Academy during this institution's earliest years are beautifully done; photographs of Academy organizations made fifty or sixty years ago depict the features of each member's face as clearly as one could wish or hope for. Mr. Burgess also made pictures throughout the rest of Virginia, especially in the Natural Bridge area and around Altavista where his great friends, the Lane brothers, lived. Many of these pictures were printed and sold as postcards; all of them were carefully copyrighted. Collectively, his photographic output is a vigorous, graphic, detailed history of Central Virgina, at least for years 1900 through 1935. A book could be written based upon them. Mr. Ramon Thacker, Mayor of Scottsville, Virginia, was the executor of Mr. Burgess's estate. In an intervview with this writer, Mayor Thacker indicated that Mr. Burgess left to his estate 485,000 postcard views of various places and groups -- many in color -- and more than 20,000 pictures, many beautifully mounted. Some were given to the University of Virginia's Alderman Library as a special historical collection under the Burgess name, many now belong to the Scottsville Museum, and Mr. Thacker retains a large number for his personal collection. Fluvanna and Albermarle County families still treasure a few of the Burgess postcards which have somehow been saved through the years. Deeply artistic in temperament, a man who loved beauty and saw it everywhere, Mr. Burgess lived in his own creative environment. He wrote beautiful poetry -- romantic, nostalgic, conservationist, patriotic, religious, and futuristic -- and newspapers, journals, and magazines throughout Virginia and elsewhere printed his verse, accompanied by laudatory comment. He published at least two anthologies of his poetry, perhaps more. For many years he leased, operated, and managed the Victory Theatre in Scottsville where numerous cultural events which he sponsored were held and where he introduced silent movies and early sound films. A lifelong Baptist and a member of Fluvanna Baptist Church, he attended services regularly and reared his children in the tradition of a church-approved, God-fearing orientation toward life and its vicissitudes. Some of his friends and acquaintances considered him to be eccentric in many aspects of his life style, though never harmful to anyone, of course. Because of his absolute determination to photograph everything he encountered, animate or inanimate, even his relatives at times regarded him as a "pest." People had to stand perfectly still for long periods of time in order that the early photographs might be successful. Many individuals had to be importuned or begged to do so because they preferred to do other things, hated to "waste" time, and lacked an appreciation for the value of Mr. Burgess's work, in terms of the future at any rate. Despite his difficulties, William Edward Burgess worked on and on, his enthusiasm for his photography and his poetry a vital, driving force until the end of his days. He died in Altavista, Virginia, of a heart attack on July 20, 1935, in the sixty-fifth year of his life. Typically, he was in Altavista on a mission to photograph several places and groups of people. Today he sleeps in the Burgess Family Cemetery at Locust Grove, beside his wife and young son. The cemetery, located in a small grove of trees on a steep hill, overlooks the Hardware River at a point where Highway 6 West crosses it on Temperance Bridge, once a wooden covered structure. William Edward Burgess was a historian, whether he realized it or not. Although many of his photographs have been lost -- victims to floods, fires, human carelessness, or the wear of time -- enough remain to tell us in detail how people lived and what they cared about in the early years of the twentieth century. This is a significant legacy, grist for the historian's mill, and deeply appreciated by many of us living today. Let us give thanks for the life of W.E. Burgess, for his sensitivity to the special ambience of his time in history, and for his photographs and poems highlighting and preserving the long ago. The first three photos were provided by A. Raymon Thacker of Scottsville, Virginia. Raymon served as Scottsville's mayor for over 30 years and was a close friend of Willie Burgess. The Burgess wedding photo was provided by Rita and William Burgess of Palmyra, Virginia; William is the grandson of William 'Willie' Edward and Ellen Gentry (Cornett) Burgess.